After the darts contest has been recorded, the crew next produce captions to superimpose over the recorded footage. The process requires the close cooperation of the entire crew. The art department has constructed caption boards by applying white transfer lettering to black pasteboard. 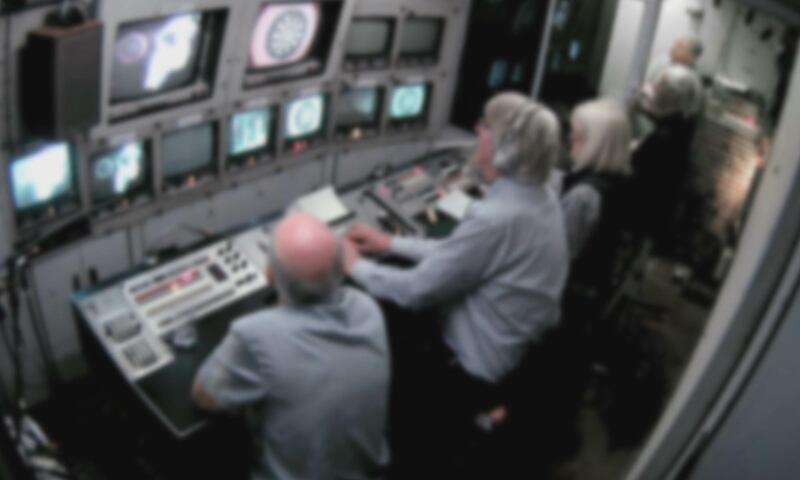 One camera focuses on the caption boards while the videotape engineer runs the recording of the darts contest. Using the vision mixer in the outside broadcast truck, the white letters can be superimposed over the videotape recording of the darts contest. The black background is filtered out by the vision mixer. This process is repeated for each caption – from the opening title at the start of the programme, through captions for individual players as they appear on the screen, to the closing titles at the end of the programme. The video below shows in detail the process of adding captions to a recorded programme using a vision mixer and videotape recorder. At the end of the outside broadcast reenactment, the crew take a moment to reflect upon the experiment they have taken part in.